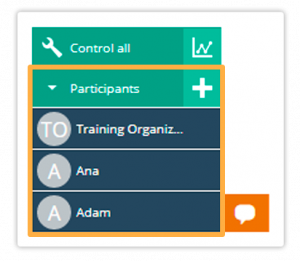 The participant controls in the Virtual Classroom menu allows you to control what individual participants or all participants can do in the room. 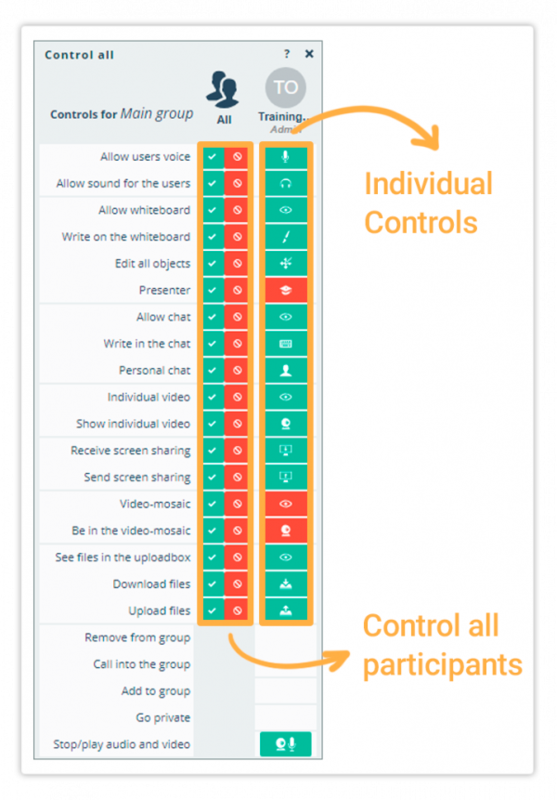 You can turn participants’ camera and microphone on or off, as well as control their access to the chat, online whiteboard, files, etc. The menu is located on the lower right cornerof the virtual classroom where you can see the list of all participants currently in the room. You have two options to control the participant permissions – you can do it by changing settings for all participants or by changing settings for an individual participant. This menu gives tutors the option to control the settings for all participants currently in the virtual classroom. Click on (Control all) to open the menu. The menu consists of Control all participants and Individual Controls. The Control all controls affect all the participants in a certain group. The (Tick) icon allows a particular permission for all participants. The (Deny) icon stops a particular permission for all participants. The Individual Controls affect only a particular participant. The (Green Microphone) icon states that a particular permission is allowed. The (Red Microphone) icon states that a particular permission is not allowed. NOTE: Even if you change the permission for ALL participants, the next participant who enters the room will have the default permissions. There are two types of controls – for speaking and listening. You can also find both types of controls in the Quick Controls in the Video mosaic. Allow user’s voice (Microphone) – this permission switches on/off the microphone. When switched off the participant is muted. To mute all participants at once, click the (Deny) icon. Allow sound for the users (Headphones) – this permission controls whether or not the participant can hear the others in the room. When stopped the participant can no longer hear the other participants in the room. He/she can still speak and be heard by the other participants. To mute all participants at once, click the (Deny) icon. There are three controls for the online whiteboard – for access, writing and for editing other participants’ elements. Allow Whiteboard (Eye Icon) – this permission hides/shows the online whiteboard. When stopped the participant cannot see the content on the online whiteboard, nor can he/she write or draw. To hide the online whiteboard for all the participants at once, click (Deny). Write on the Whiteboard (Brush Icon) – this permission controls whether or not the participant can write on the online whiteboard. When stopped the participant can see the content on the online whiteboard but cannot interact, draw or write on it. To stop all participants from writing at once, click (Deny) . Edit all Objects – this permission controls whether or not the participant can edit other participants‘ elements on the online whiteboard. When stopped the participant cannot edit other participants‘ elements on the online whiteboard, write simultaneously in the text editor with other participants, or use the UNDO/REDO functions. To allow all participants at once, click (Tick) . Presenter (Presenter) – this permission provides/takes away the ability to be a presenter in the room. This permission assigns a presenter role to a specific participant. As such he/she will be able to use the Synchronised mode, enter into Presentation mode, share YouTube and other media in the Media player, share files on the online whiteboard, or create and edit online whiteboard sheets. Allow Chat (Eye Icon) – this permission hides/shows the chat. When stopped the participant cannot see the content in the chat box but can still write and send private messages. To hide the chat for all participants at once, click (Deny). Write in the chat (Keyboard Icon) – this permission controls whether or not the participant can write in the chat. When stopped the participant can see the content in the chat box but cannot write in the Group chat. To stop all participants from writing at once, click (Deny) . Personal Chat (Person) – this permission controls whether or not the participant can send private messages to other participants. When stopped the participant cannot send messages to the other participants but can still receive messages from them. This permission is global (works for all groups created in the room). There are two controls for the Individual video windows – to see individual video and to have individual video. Individual video (Eye Icon) – this permission shows/hides all individual videos and screen sharing for the participant. When stopped the participant cannot see individual video windows, e.g., the presenter’s video which is turned on by default. To hide the individual videos for all participants at once, click (Deny) . Show Individual video (Camera Icon) – this permission shows/hides the participant in an individual video window. By default all participants are shown in individual video when only the tutor and the participant are present in the room. This permission should be allowed when the participant wishes to share his/her screen. There are two controls for the Video mosaic – to see the Video mosaic and to be present in it. Video mosaic (Eye Icon) – this permission shows/hides the Video mosaic windows for the participant. It is stopped by default. When stopped the participant cannot see the other participants but they can still see him/her in the grid if he/she is allowed in. To hide the mosaic for all participants at once, click . This permission is global (works for all groups created in the room). Be in the Video mosaic (Camera Icon) – this permission shows/hides the participant in the Video mosaic. When stopped the participant is not shown in the grid. By default the presenter is hidden from the Video mosaic. When the internet connection is slow it is recommended to show the Presenter in the grid and stop his/her individual video. To forbid all participants from showing up in the Video mosaic at once, click (Deny) . This permission is local (works only in the current group). There are three controls for the Upload box – for access, downloading files and uploading files. These permissions are LOCAL. See files in the Upload box (Eye Icon) – this permission denies/allows access to the Upload box. When denied, the participant does not see the content in the upload box and cannot download files but can still upload files by dragging and dropping them into the box or by using the Select button to browse his/her computer for files. To stop access for all participants at once, click (Deny) . Download files : (Downloading) – this permission denies/allows the participant to download the files in the Upload box. When stopped the participant cannot download files but can still see the file information. To stop all participants from downloading files at once, click (Deny) . Upload Files (Uploading) – this permission denies/allows the participant to upload files in the Upload box. When stopped the participant cannot upload files but can still download them and see the file information. By default this permission is stopped. To allow all participants to upload files at once, click (Tick) . 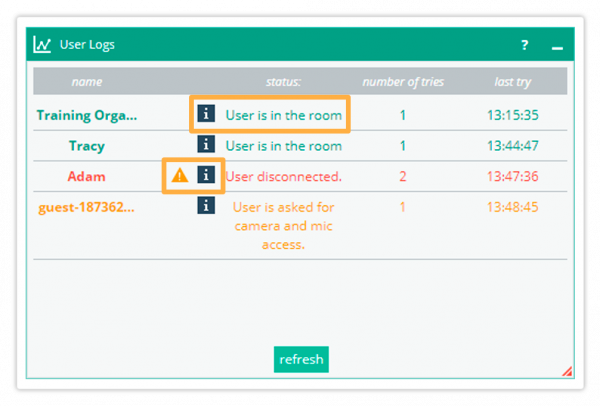 You may find additional information on each participant entering the room, as well as their status, ID, connection and technical specifications, by clicking on the Info button on the right side of the log. The Error indicator will let you know if the participants are experiencing any errors during the system check. Clicking on the Additional info button allows you to see further information about the participant. 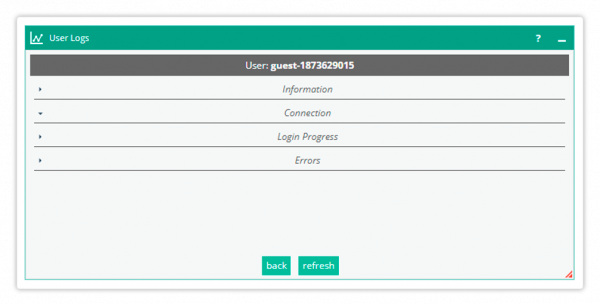 To refresh the logs and follow the login progress and status of your users in real time during each step of the system check, click on the button. The participant list is located directly under the Control all participants menu on the lower right-hand side of the screen. The participant list is expanded by default but it can be collapsed using the triangle icon on its left side to improve visibility in the virtual classroom. The (Plus) icon located on the right side of the participant list allows you to invite participants to the session via email. The way this is done is identical to the way you would do it when opening the room. 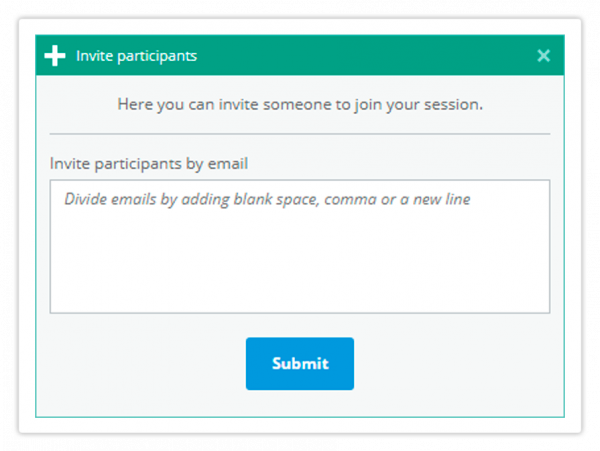 Once clicked, the icon opens a new window allowing you to enter the email address(es) of the participant(s) you would like to invite to the session. They will receive an invitation with an access link within several seconds. You have access to the same participant controls as in the Control all menu through the Participant list control menu. The difference is that, unlike with the Control all menu, any changes you make here affect only the participant you selected. You can open that menu by clicking on the name of a particular participant in the list. 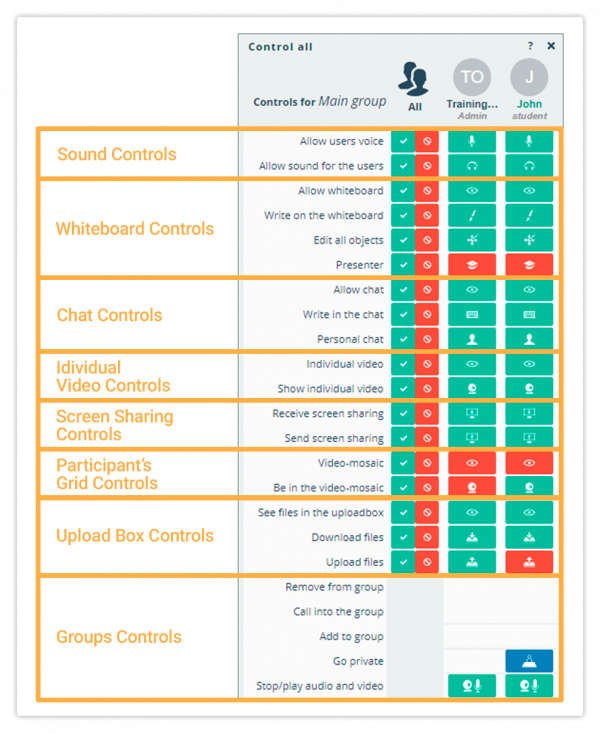 Three unique functionalities are available through the Participant list – High video quality, which allows you to switch the participant’s video quality between high and low, Request user’s screen, which sends a request for screen-sharing, and Ban participant, which immediately bans the participant from the room. Only the tutor can use these controls. This control is useful if a participant is experiencing connectivity issues. The video quality is High by default, but you can switch it to low (un-check the box) in order to reduce the load on the participant’s connection. 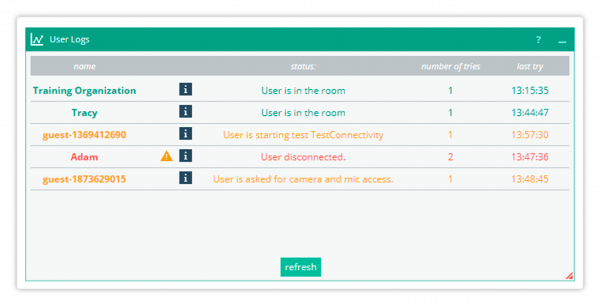 NOTE: If a participant loses connection and then re-enters the room at any point during the session the system check will automatically switch this setting to Low. He/she has installed the Screen Sharing Extension (Google Chrome only) – see the screen sharing section here for further details on how to install it. Both the tutor and the participant can stop the screen sharing at any time. Bans the participant from the room. Once you have clicked on it you will remove the ban and the participant and can re-enter the virtual classroom. 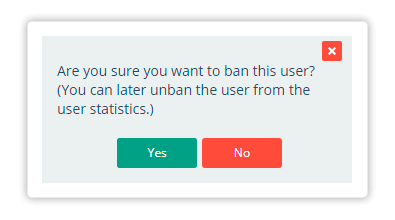 If he/she still appears on the ban screen after you have unbanned him/her then he/she will first need to refresh his/her screens in order to enter the virtual classroom.